Location: North 61:38.145, East 006:24.306 (GPS at the summit). A good place of reference is the village Skei on E-39. Skei is located at the north end of the big lake Jølstervatn. Measure from the traffic circle at the end of the lake, just in front of the Skei hotel. Continue north on E-39. Around 3.2 kilometer, look for a small road that goes left. There is a sign saying "Breimsvatnet 6 km". Turn onto this road. At kilometer 7.4,the road forks. Take the left fork and continue to kilometer 7.7, there is a turnout on your left side, before you get to the first farm. There is space for 2 cars. Park here, the location is N61:37.030, E006:27.212, elevation about 72 meter. You start 1400 meter below your destination, which can be seen straight ahead. Continue along the road about 100 meter, before the first farm a forest road turns left and climbs uphill. Follow this road (new in 2010), as it zig-zags uphill. 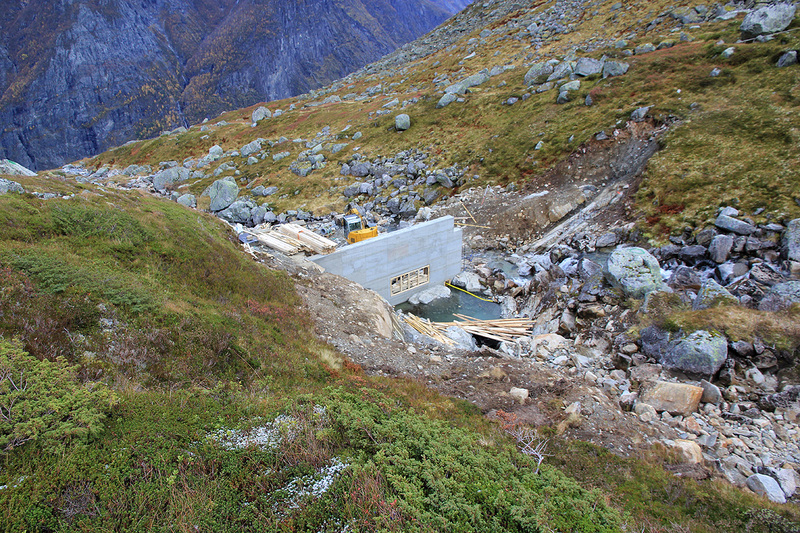 The road serves a tunnel that (in 2010) is being built quite high up, most likely some hydro power project. In the last sharp curve going left, leave the road and pick up a small trail that traverses a bit right. In about 50 meter it merges with the old trail that continues steeply uphill. Follow this trail until the terrain gets more gentle. The trail is now close to the creek and in this area (again in 2010) a small concrete dam is being built. Cross the creek just below the dam and continue uphill along the trail. This trail will get you up to a level area, then curve right, you will see a nice basin circled by mountains straight ahead. 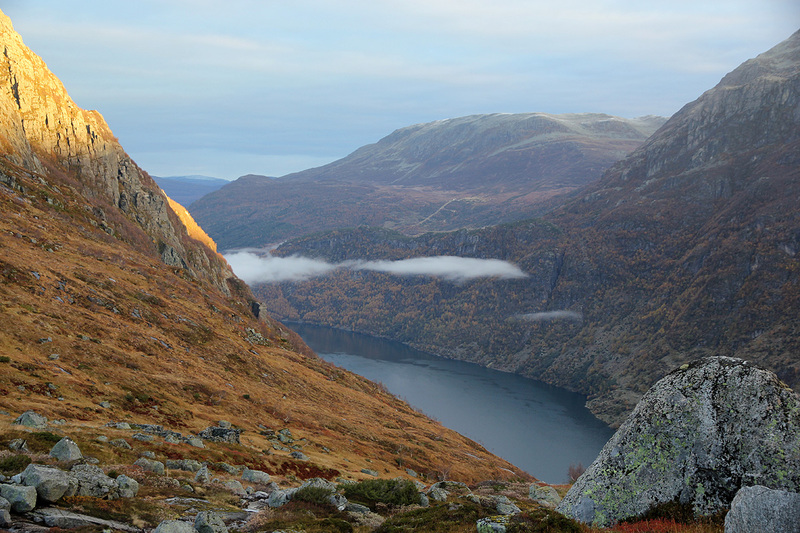 Follow the trail as it stays on the right hand side of the creek and gain the area just before Tverrlivatnet (859m), there is a mountain hut near the lake outlet. Turn more right and gently gain more elevation as you now hike more north in order to follow the Skjorta south ridge to the summit plateau. Higher up, you will merge with a cairned trail (also marked with red paint). Continue along this trail, it will gain the almost flat summit area. 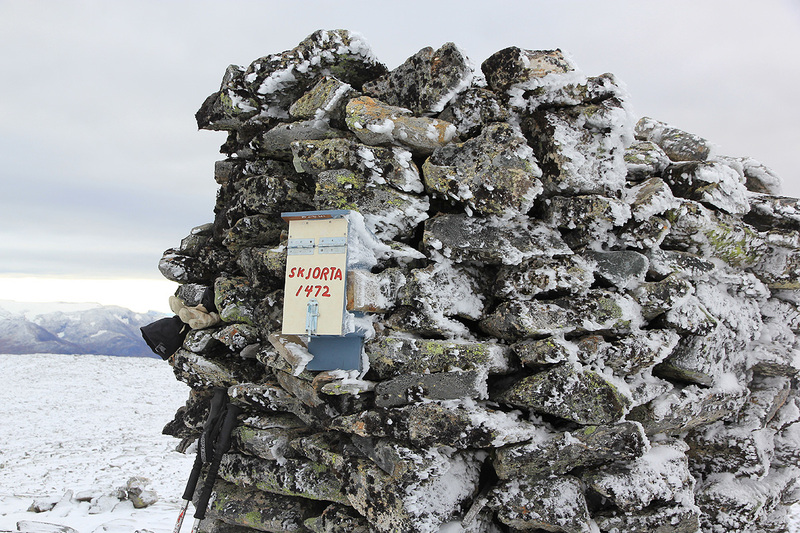 The summit is almost one kilometer further north, marked with a large cairn and a summit register box. 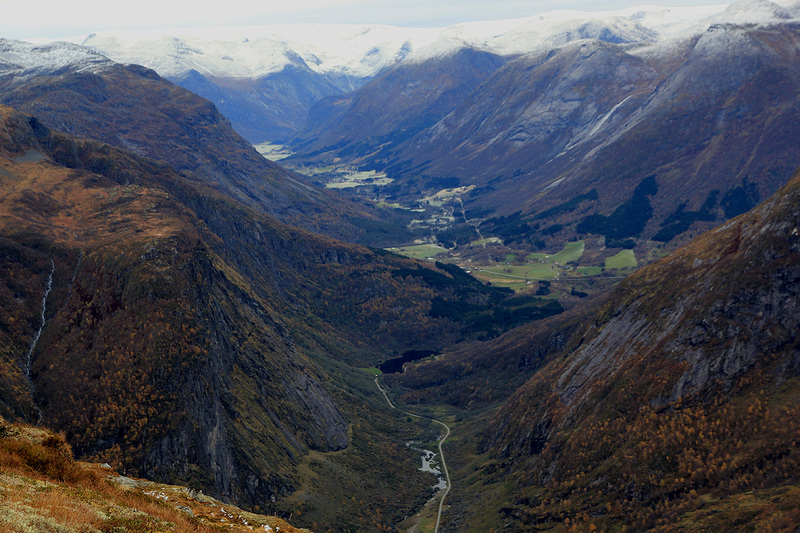 I drove from Bergen around 1600 and arrived at Skei hotel shortly before 2000. A nice meal (local trout) and early to bed. I woke up around 0600, Orion could still be seen on the southern sky. A bit of internet, then breakfast at 0700. I drove to the trailhead and realized that a new road going uphill the way I intended to go, had been constructed. I found a good place to park and headed uphill by 0800. 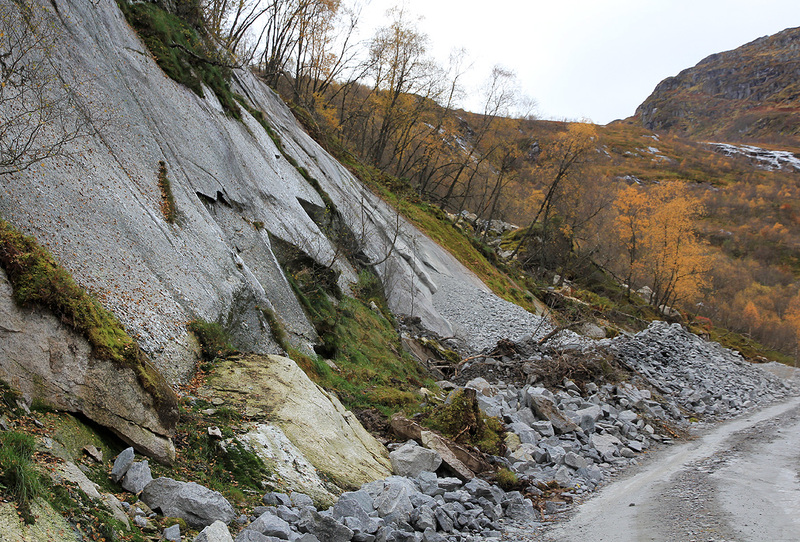 Getting near the end of the road, a small rockslide suddenly appeared in front of me. Rocks came down from above and bounced onto the road. I quickly realised that a truck must have sent these rocks crashing down from the next switch-back on the road higher up. A warning sign would perhaps have been in order? I left the road in (what turned out to be) its last sharp left curve and picked up a small trail that soon merged into what obviously seemed to be the old trail coming up from the valley. 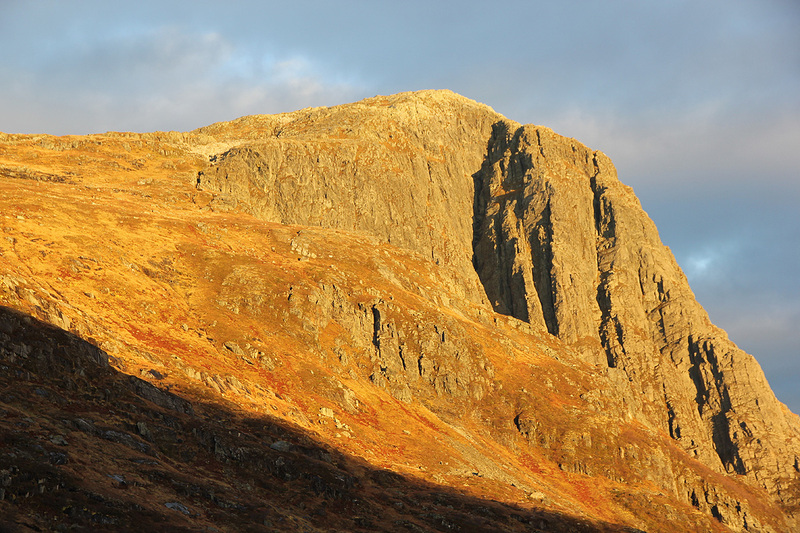 The sun was now hitting Skjorta, great morning light. I was definitely about to leave the valley below me. Higher up, this trail crossed the small creek on a (possibly temporary) bridge, then led me to a new (local) area of construction. The trail continued uphill and turned along the creek, obviously heading to the small hut near the lake outlet. 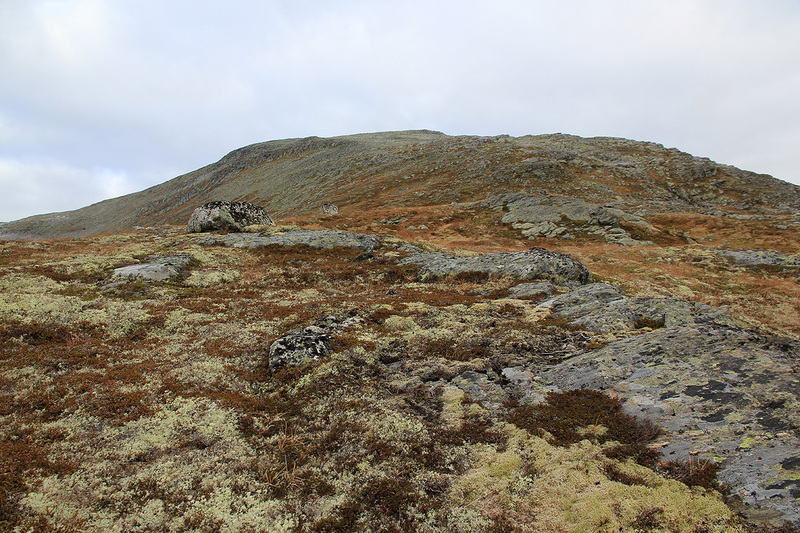 I turned more right and started to climb towards the south ridge of Skjorta. The route was pretty obvious and quite easy. Soon, I gained the main, almost flat summit plateau and started across to the main summit, located on a small, local top. Arriving there at 1045, the weather was overcast, but with pretty good visibility all around. I signed the very well designed summit register, and took some photos. The forecast had predicted -10 Centigrade here today, a definite sign that winter is around the corner. I guess it was slightly warmer and no wind. I left at 1100 and started retracing my steps across the big, flat area. 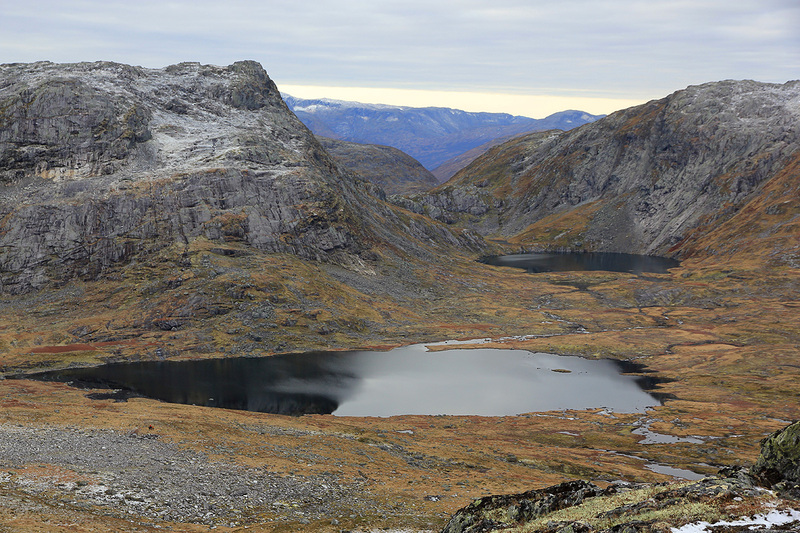 I returned by going slightly closer to the lake, the visibility was still nice as I looked across into Stardalen as well as back down to the small farms near the trailhead. Nobody to be seen as I walked down the new (and very ugly) road, reaching my car by 1120. 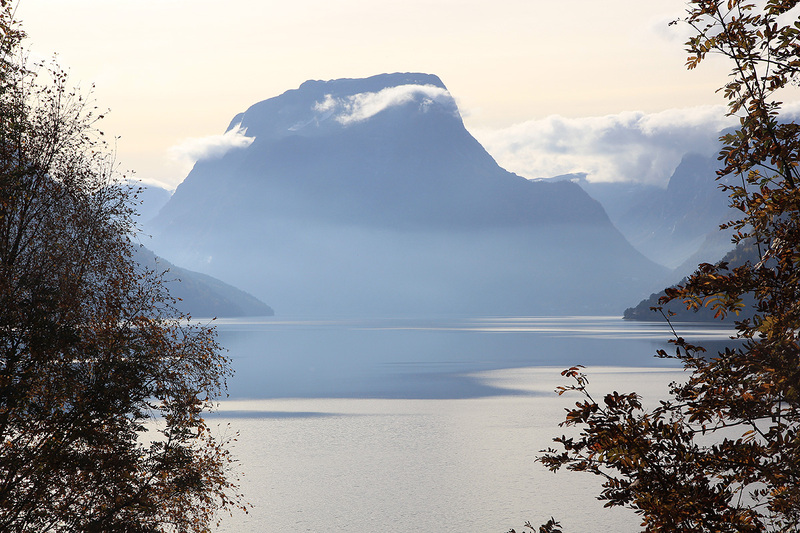 Skjorta, seen across Breimsvatnet, a week earlier. 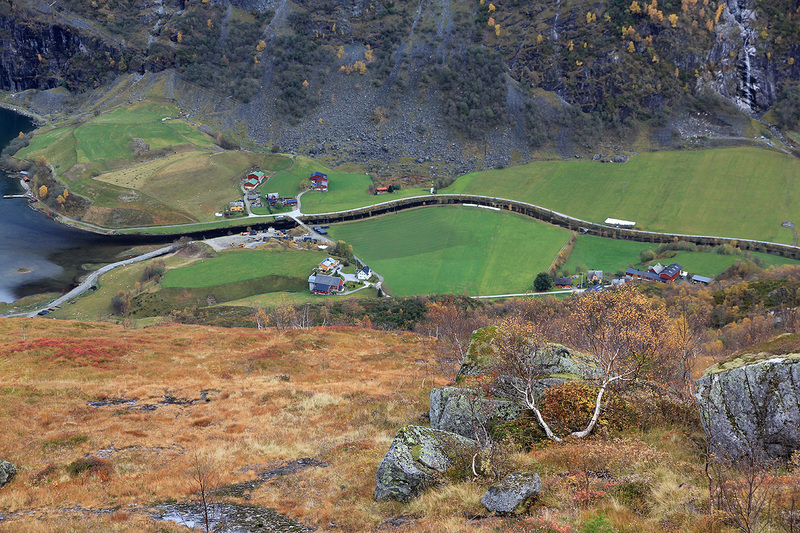 The farms at the end of Breimsvatnet (trailhead). 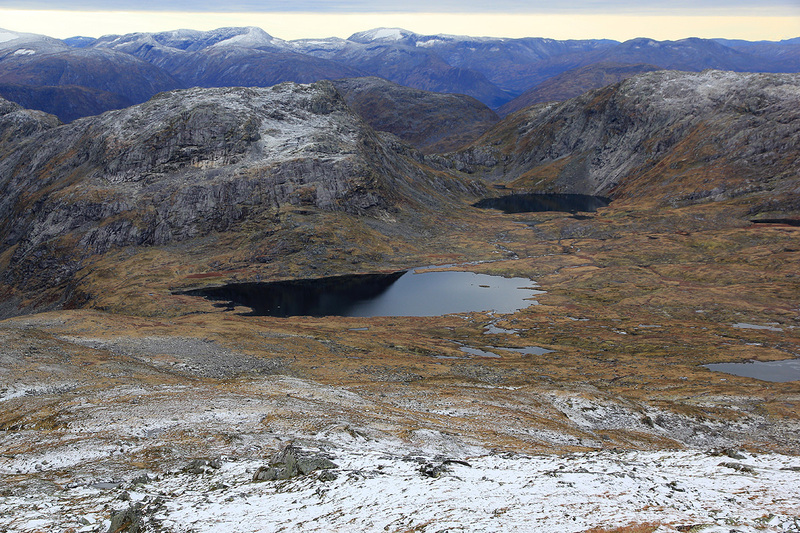 Tverrlivatnet and Vasskarvatnet, seen when descending. 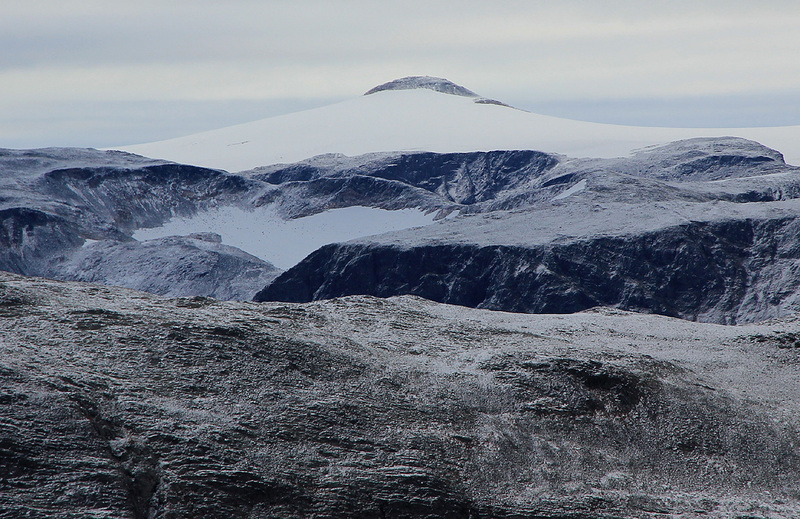 Snønipa, as seen from the summit. 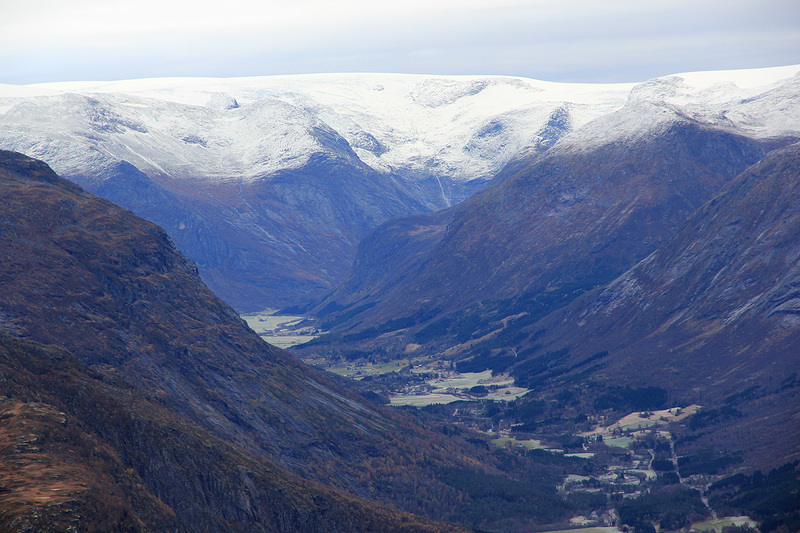 Stardalen, the road to the trailhead in the foreground. Summit Panorama II, continued south. 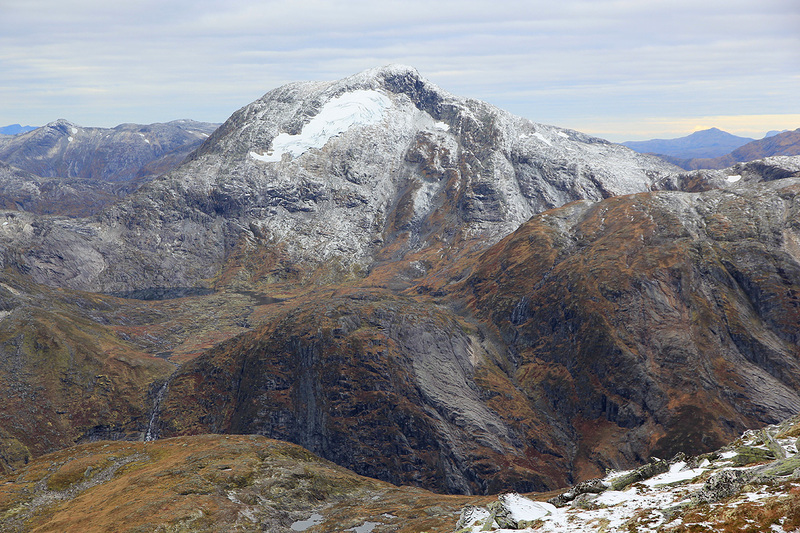 Summit Panorama III, south to west. 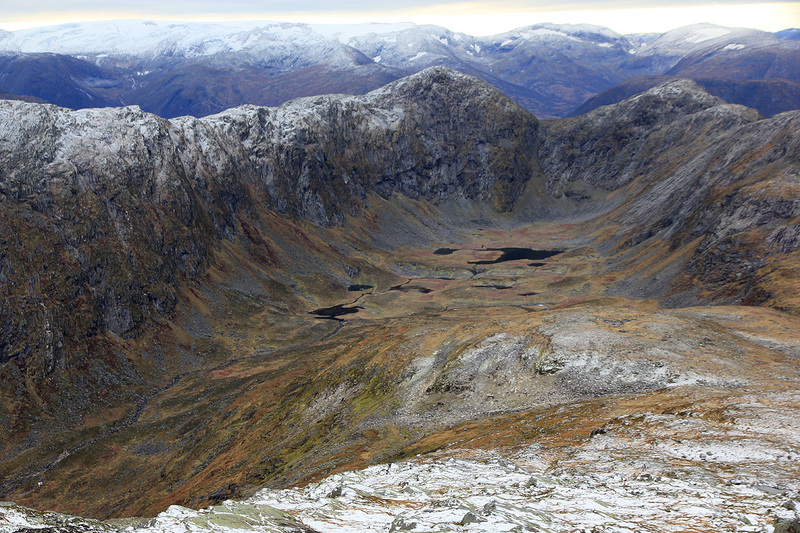 Summit Panorama IV, west to north. 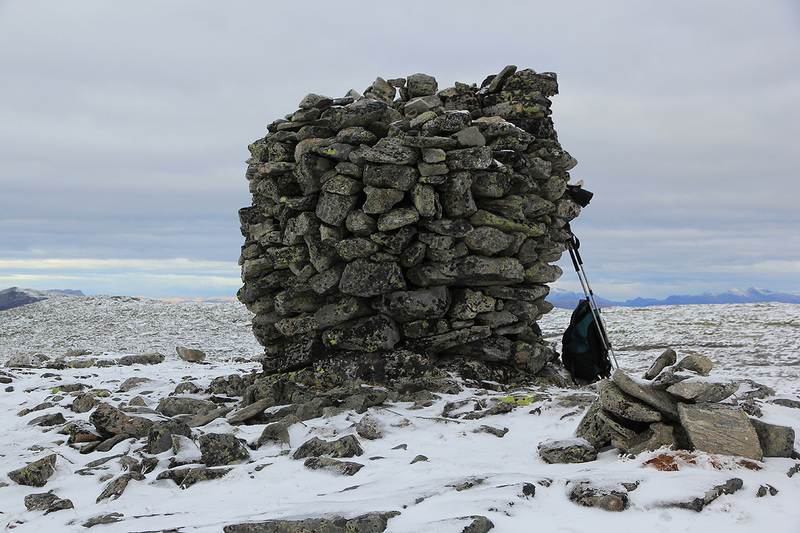 Summit Panorama V, north to Møre and further east.